In the spring of 1972 when I was making plans to take my one woman version of “The Mill of the Floss” to the Edinburgh Festival fringe I plucked up courage and wrote a letter to Gordon Haight asking his help with some programme notes. I had, of course, read and greatly admired his definitive biography of George Eliot, but I had never met him. Some weeks later I received a telephone call from him. He told me he was in London, he didn’t know how he could help m but suggested that I might like to see him at his hotel the following day. I was both excited and very nervous at the prospect of meeting this eminent man. His kindness, humour and charm put me at my ease at once. We has long talk and he showed a generous interest in what I was doing. He suggested that I might use an extract from the introduction to his edition of “The Mill of the Floss”. 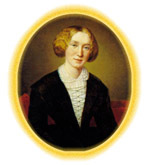 On his return to the United States he wrote saying that he had been unable to find a copy for me in London, and that he had ordered one to be sent but meanwhile the article had been reprinted in “A Century of George Eliot Criticism”. I was extremely grateful for his help and of course used an excerpt in the progamme. I later sent him a copy of a notice I received in “The Scotsman” which I thought might interest him and received a courteous reply.